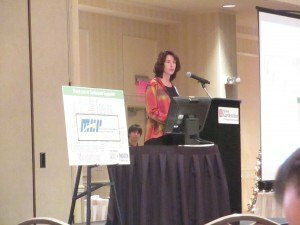 At the recent Energy and Innovation Conference, the National Energy Technology Laboratory (NETL) and its university partners explored the role of innovation and technology commercialization in advancing energy options to drive economic development, strengthen national security, and improve the environment. NETL’s Regional University Alliance for Energy Technology Innovation is a consortium of five nationally recognized universities, including West Virginia University, Carnegie Mellon University, the University of Pittsburgh, Pennsylvania State University, and Virginia Tech. The consortium assists NETL in conducting research to support the U.S. Department of Energy’s mission to advance national, economic and energy security. Dr. Cynthia Powell, Director of NETL’s Office of Research & Development, highlighted NETL’s recent successes, including five R&D 100 Awards in the last 12 years. She noted that NETL’s research is intended to make fossil energy an affordable, sustainable domestic resource by reducing environmental impact and producing unconventional resources like the shale gas. Major successes at NETL center on carbon capture simulation and materials, national risk assessment of carbon capture, and shale energy. Presentations examined an economic outlook on monetary policy from the Federal Reserve Bank of Cleveland and an overview of the region’s historic role as an energy leader. Sessions offered participants expert advice on R&D centered on oil and gas production and utilization, materials design and development, and process design, integration and optimization. Seminars on open innovation and intellectual property were also offered. The conference concluded with an energy matchmaking session to bring together manufacturers, business leaders, scientists and engineers, venture capitalists, and environmentalists to accelerate technology development.